What follows below is the result of a cosy chat that Paul, Gay and myself enjoyed in late last year. Over a few glasses of a fine Burgundy, I managed to prise from them a few of their tales as to how Bonzo has played a part in each of their lives and some of their other stories. We thought you'd enjoy the (edited) highlights! Richard: What is the earliest memory each of you have of Bonzo? Paul: I must have seen Bonzo lots of times as a child, but I was really a Rupert Bear fan at the time. There was an old lady called Alice who had a newspaper stand near where we lived in east London, and she always saved me the Rupert books and comics when they came out - obviously on the orders of my parents! I also used to get 'Dandy' and 'Beano' amongst other comics and, when I was a bit older I got into the 'Eagle', but I don't consciously remember being too aware of Bonzo. Gay: A print of "Bonzo Turns Bones", which was hung on the wall in the bedroom I slept in as a young child when I stayed with my Aunt in Surrey for a fortnight each Summer. P: I'd known Gay from Art School and then later on when she'd started in the antiques business. She had prints and bits of Bonzo memorabilia around the flat and I actually used to give her things to add to her collection before I got into it myself, so I suppose I first became really aware of him by visiting Gay. That would have probably been over 30 years ago. R: How did you both first become interested in collecting Bonzo? G: In 1966, when I first started to deal in antiques and odd pieces of ephemera, I met Avril and Edward Broad who had a stall on the Portobello road in London on Saturdays and lived above their shop in Hastings, on the south coast, during the week. They sold phonographs, old gramophones, coronation mugs, pieces of brass, bric-a-brac and old postcards. While staying with them in Hastings I glanced through one of the postcard albums which contained eighteen Bonzos. I bought them all for two old pennys each - today that would be 15 pence the lot! From then on many other friends gave or sold me anything they found connected with Bonzo, but I think Avril and Edward unearthed the most. P: After seeing Gay's collection, which was quite modest at that time, I had to break it to her that she was to have a rival and that all future presents were to consist of something else! I was mainly attracted by Studdy's sense of humour and the fact that he was an amazing draughtsman. There weren't a lot of Bonzo collectors around at the time and certainly almost nothing written about George Studdy. We didn't have any idea what was out there to collect, or how prolific he'd been for the 25 years or so before the Second World War. R: What was the first item in your respective collections, and do you still have them? P: I don't really know what I bought first, but it was almost certainly a postcard. 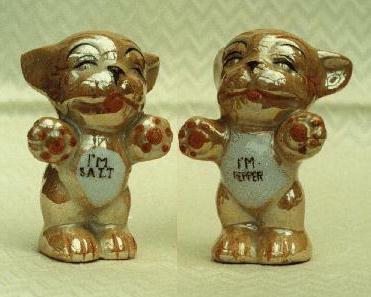 I remember getting the 'I'm Salt' and 'I'm Pepper' Bonzos quite early on. In those days postcards were about 3 to 6 old pennies each (roughly 1½ - 2½ pence today). I'm sure I have the first bits as I almost never sell anything. G: The first three dimensional Bonzo in my collection also came from the Broads in Hastings. 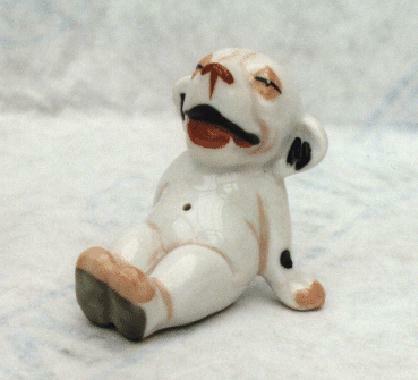 It was a seated laughing ceramic Bonzo, and yes I still have it. R: What are your favourite and/or most treasured items in your collections, and why? G: It is impossible to choose just one item. One of my favourite images is "Two's Company", and I'm very lucky to have the original painting. It describes perfectly the feelings of a new father. Also I love "Bally-ho Old Bean!" (see page 93, postcard no. 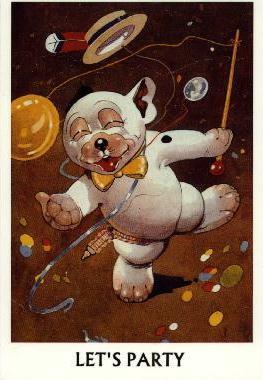 2391 in our book), because it shows Bonzo having such a good time. One more favourite - there are so many - is a rare Pan Yan Pickle poster because it was given to me by George Studdy's brother Hubert. It was not in a very good condition and he sent it to me folded in an envelope marked 'open tenderly, an invalid inside'. P: There are so many! I was lucky that 25 years ago illustrators and cartoonists were not held in high esteem by the art world as much as today, so I was able to buy quite a few original paintings and drawings relatively cheaply. A lot were sold by Hodgson's Rooms - a book auction house now incorporated in Sotheby's. Gay and I just kept on bidding until we'd got almost everything - about 30 lots spread over five or six sales. My real favourite isn't actually a Bonzo, he's on postcard #348 - "I 'shure you I'm not!". It's an unbelievably delicate bit of painting and, at the time, cost me £50, although I could never sell it! I'm also very fond of the Cowan's Toffee pail (page 65 in the book). I swapped it for some old toys that I'd collected over the years, it's quite worn but I love it. R: How did you first meet up with each other? G: As Paul mentioned earlier, we went to the same Art School in Walthamstow, north-east London. Paul left the year I started (in the early sixties) but we met through mutual friends and got on so well, we've been great friends ever since. R: How long after that first meeting did you decide to compile and write your book? P: Gay and I had always collected together but separately. If something came up and I couldn't afford it, I'd tell her and vice versa. When we started, we knew nothing at all about Bonzo and even less about George Studdy. At some point we decided to try and find out their history. It was totally for our own information and was to be private research for our own curiosity. We'd go to the British Library and source as many book titles as we could, and Gay spent days in the newspaper department of the Library at Colindale, north London. All the time we were going to postcard and antique fairs to add to our collections as well. G: When I first started accumulating Bonzos, Paul was one of the friends who looked out for them for me. Within the year he decided that he loved them himself and started his own collection which he built up very quickly and it wasn't long before between us we had quite an impressive collection. Paul suggested that we should write a book together in 1978. He got a pass for the British Library and I followed suit. We found quite a lot of interest there and from the newspaper library in Colindale. We went religiously to as many postcard fairs as we could. Paul also contacted other collectors to complete the postcard catalogue in the back of our book, for which he must take most of the credit. R: How difficult was it to find all the background information that you needed for the book? P: Very difficult!! There wasn't much written about Studdy and, as with most research, it's very dangerous to assume that all printed information was accurate. 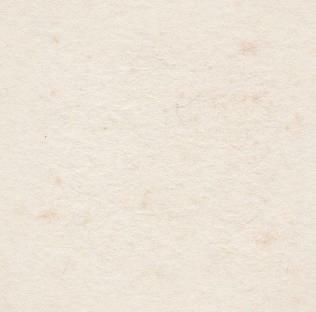 We virtually had to start with a clean slate and it became a real piece of detective work. Gay started with the obvious and telephoned all the entries under Studdy in the phone book! That put her in touch with his brother, Hubert. We also went to look for the birth, marriage and death certificates, and generally anything that was on public record. Meeting Vivienne, his daughter, was a real breakthrough, although we'd rather been pipped at the post as she'd signed an agreement giving the book rights to somebody else. 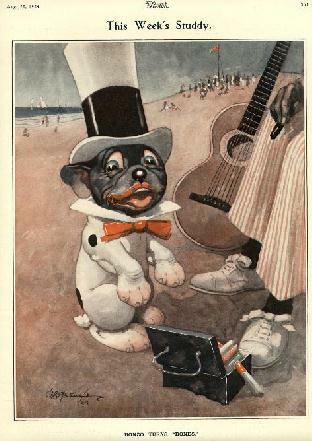 That wasn't too much of a problem because all we wanted was to see a good book on Bonzo published. G: 1978 was the year I first contacted Hubert Studdy, George's younger brother. He refused to meet me but wrote me many amusing and interesting letters about his brother and his family. When he died a year later, his widow Gwynneth contacted me and we became friends. Gwynneth put us in touch with Vivienne, George Studdy's daughter. Vivienne's help was invaluable. P: When the book agreement lapsed, and with no book having been published, Vivienne offered us the chance to take over. We stepped up our research but, as we both had businesses to run, we couldn't afford too much time on the project. We'd meet most Fridays to discuss what we'd found out in the week. We had a lot of trouble finding a publisher willing to take on the book - very few like to take a gamble and to most of them Bonzo wasn't well enough known. I was staying with an old friend, Richard Dennis, at his home in Somerset - in the south west of the country - and he asked what luck I'd had. Although he mainly publishes books on ceramics, he offered to back us with Bonzo (he's since done books on the French cartoonist Raymond Peynet, Chloë Preston, Arthur Elsley, and soon will be publishing the works of Mabel Lucie Attwell). We had a lot of luck in finding the information, but it involved hours of unproductive research as well! R: Do you both still collect Bonzo/Studdy items? G: Yes, but it is increasingly difficult for Paul and I to find items we haven't already got! P: Absolutely! Thankfully having built up a decent collection early on, we don't have to look for too much, but we still have to bear in mind our budget and not get carried away unless it's something really special. Patience is an important virtue! R: Finally, do you think Bonzo's popularity will continue, and have you any tips for new collectors? P: Apart from collectors and those who remember Bonzo first time around, there is evidence that there are a growing number of new enthusiasts. Bonzo is licenced by Gresham Marketing Gmbh who, although based in Kaiserslautern, Germany, represent Bonzo throughout the world. There are currently several projects under way involving new merchandise - some mass market items and some for collectors. A series of 12 reprints of original postcards was issued recently by Mayfair Cards of London, UK who had changed the captions only slightly to bring them up to a modern day meaning. G: I would suggest collectors scour the markets, postcard fairs, salerooms, junk shops and collectors publications. P: The collecting market is very strong world-wide at the moment, and shows no sign of slowing down. The easiest things to start collecting are probably the postcards which are comparitivley cheap, and are in the stocks of most postcard dealers. It's possible to get them at very low prices from general dealers, but it usually involves ploughing through endless shoe-boxes of assorted cards, and even then there may not be any there. The postcard fairs around this country are very well organised and most dealers have sorted their cards and know their stock. 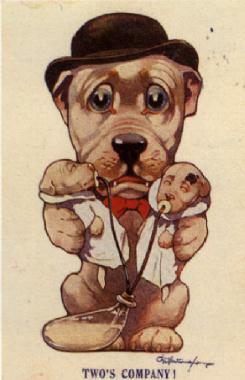 If you ask for Bonzo cards they usually go straight to them. On some occasions they might just hand you a batch of general 'Comic' cards, but at least they're narrowed down for you. It's worth keeping an eye out in junk shops, etc. where they might not know what they've got but specialist dealers are, quite rightly, the correct price, but they've done all the leg work for you and probably paid a decent price themselves. 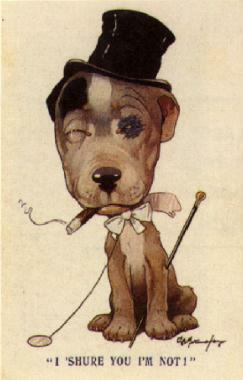 There are a number of postcards produced by Valentine's after Studdy's death, drawn by another (inferior) artist, along with the Bonzo Annuals published by Deans from 1949 onwards. I personally wouldn't pay nearly the sum of money for them because the quality is dubious in comparison. Likewise there are many Bonzo look-alikes that were done in Germany and Austria which are only interesting from a curiosity point of view. In most, but not all, cases Studdy's signature is your only guarantee! G: I'm sure Bonzo's popularity will continue. Although some of the captions and situations are definitely dated, I think Bonzo's charm is timeless! With thanks to both Paul and Gay for their time and a jolly pleasant evening!